Students from WIT were joined by teams of six from UCD, UCC, CIT and Dundalk IT. The students debated the key challenges facing the Irish agri-food industry, including the merits of CAP, the likely impact of Brexit, and whether the agri-food industry is taking its environmental responsibilities seriously. The judging panel of 12 included Tara McCarthy, CEO of Bord Bia, and Niall Browne, CEO of Dawn Meats with the final moderated by Justin McCarthy, editor of the Irish Farmers Journal. Throughout the day representatives from the Food Safety Authority of Ireland, BWG Foods, AIB, Bank of Ireland, Ulster Bank, Enterprise Ireland, Teagasc, Agri-Aware and Meat Industry Ireland, participated as judges and moderators, in a very interesting and robust series of qualifying debates. WIT was represented by Aoife Forde, Captain (Year 4, BSc (Hons) in Agricultural Science); John Dullea (Year 4, BSc (Hons) in Agricultural Science); Luke Healy (Year 4, BSc (Hons) in Agricultural Science); Michael Martin (Year 1, BSc (Hons) in Agricultural Science); Aishling Neville (Year 4, BSc (Hons) in Agricultural Science); Des Twomey (Year 4, BSc (Hons) in Land Management, Agriculture). Newcomers, CIT and UCC kicked off the day in the quarterfinal discussing the impact Brexit will have on the Irish Agri-food Industry. Although UCC put up a good fight it was CIT that would continue into the next round against WIT. For the WIT and CIT semi-final, the WIT home crowd filled the room showing support and interest for the debate to come. WIT’s captain Aoife Forde took to the stand debating consumer behaviour is the key to a sustainable food future. Both teams showed passion and knowledge of the topic, but in the end, it was CIT to continue to the final. In the second semi-final reigning champions UCD took on Dundalk IT. The teams debated the issue of CAP (Common Agricultural Policy) and its value for money. The UCD team were named the winners, securing a place in the final against CIT. 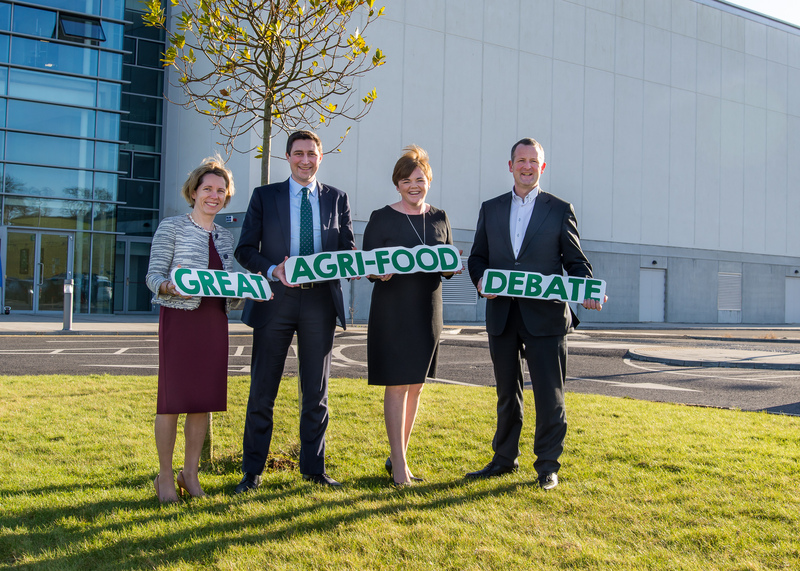 The final debate was moderated by Justin McCarthy, Editor of the Irish Farmers Journal and the judging panel included Niall Browne, CEO of Dawn Meats; Tara McCarthy, CEO of Bord Bia and Peter Garbutt of McDonald's UK & Ireland. The event culminated in a heated debate between UCD and CIT on the motion “Ireland takes its environmental responsibilities and commitments seriously”. After a long day of debating CIT were unable able to put it up to the strong UCD team. After a long wait for the judges to come to a decision, the UCD team were crowned as the 2018 winners. The winners of the Best Speaker prizes in the quarter-final, two semi-finals and final were respectively: Avril O’Driscoll, CIT; Aoife Forde, WIT; Owen Cashman, UCD; and Una Sinnott, UCD. The Great Agri-Food Debate is continuously growing year after year, attracting many companies to view the students in action. The event also gives the students the opportunity to pose questions to companies about current topics.